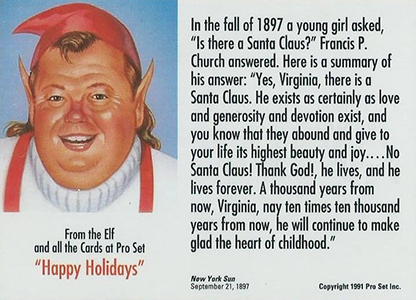 Pro Set was a card company remembered for a few things: massive print runs, evolving checklists with errors and variations, those seemingly impossible-to-find holograms and Santa Claus cards. 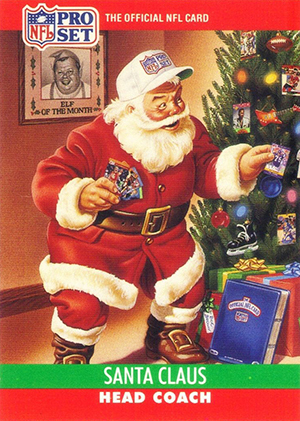 Between 1989 and 1993, the Pro Set Santa Claus cards brought a fun chase element and festive artwork to the hobby. And unlike a lot of other Pro Set cards, collectors are still chasing after them. 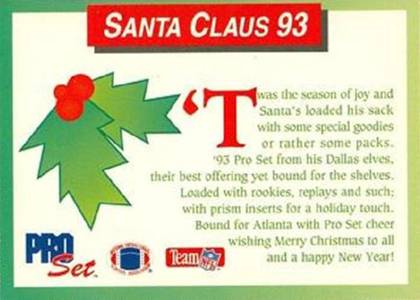 The first Pro Set Santa Claus card came out as a promo of sorts. It was sent to dealers along with a traditional greeting card that had the same artwork. Not surprisingly, the card quickly became one of the hottest in the hobby. Even today, it still sells for $15-30. The actual Christmas card that it came with is much tougher to find and can top the $50 mark. 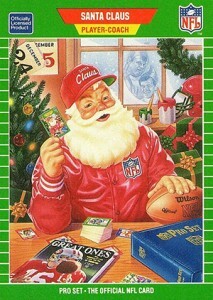 1990 Pro Set Football saw Santa find his way into packs. 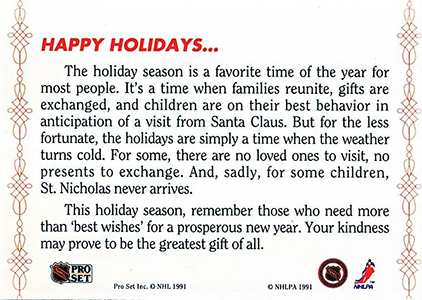 Included as a short print in 1990 Pro Set Series 2 packs, this card spoofs Twas the Night Before Christmas on the back. On the front, a traditionally painted Santa is hanging cards on a tree. There's some football, a 1990-91 Brett Hull hockey card and even MC Hammer. And if you're wondering who Rick Brown is, the name on the tag under the tree, he's the artist for the card. 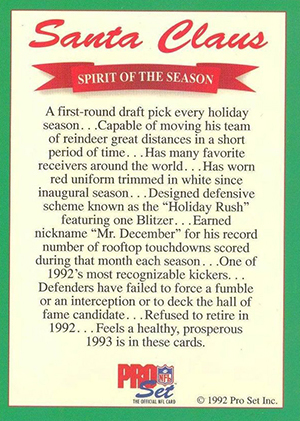 The 1990 Pro Set Santa Claus card is not difficult to find on the secondary market for a couple of dollars now. Even if they were tricky to find in packs, there is a lot of 1990 Pro Set Football out there. Hiding in plain sight on the company's first three Santa cards is Pro Set founder, Ludwell Denny. 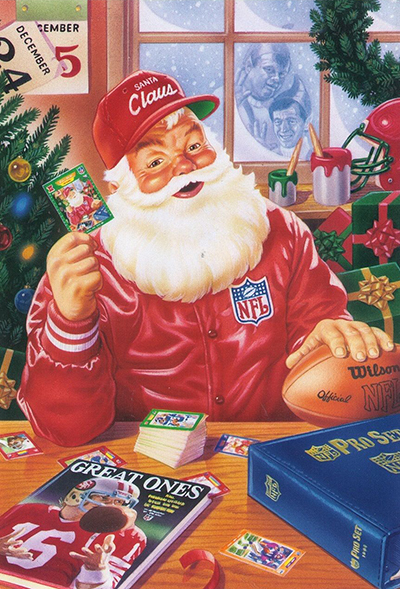 You can see him in the window on the 1989 card. 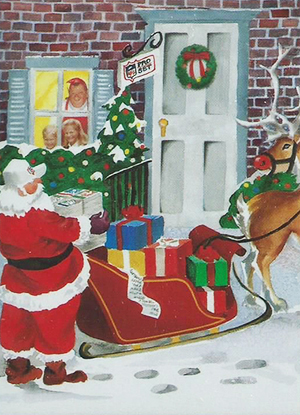 He's the "Elf of the Month" in 1990 and waiting in the window in 1991 (he's also on the back). 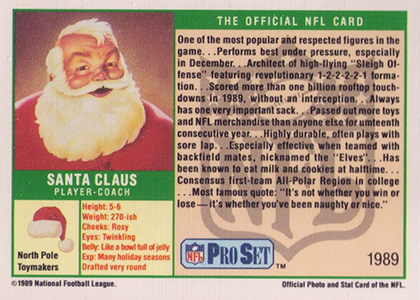 Santa continued to be an insert through Pro Set's final football set in 1993. 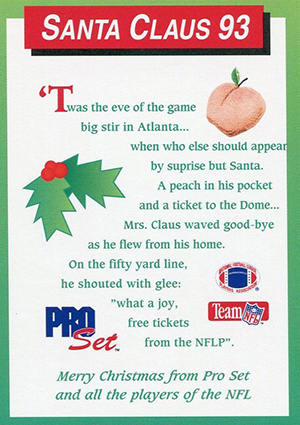 The 1991 Pro Set Santa card can be found with both an English and Spanish back. 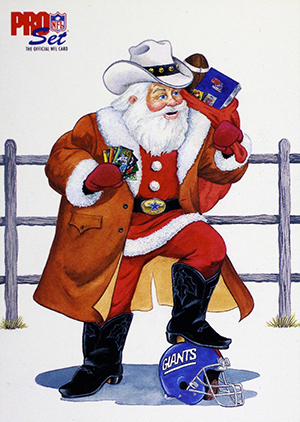 By the time the company reached its end, NFL Properties was distributing Santa Claus cards from all licensed football card manufacturers. 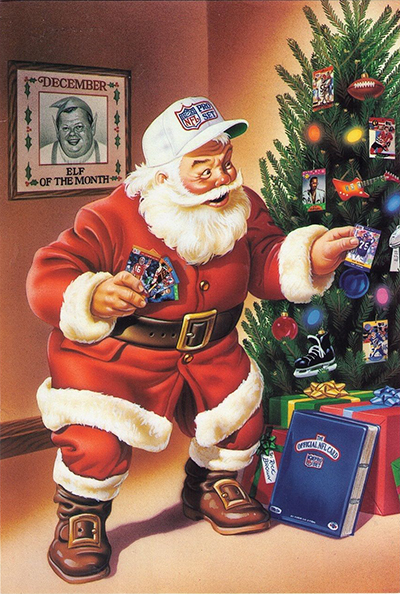 This includes a second 1993 Pro Set Santa, which is considered by most to be a promo. 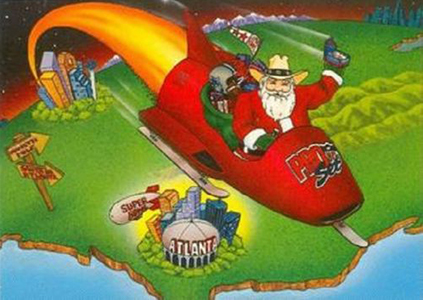 This one has Santa sitting around a fire rather than riding in a rocket sleigh. 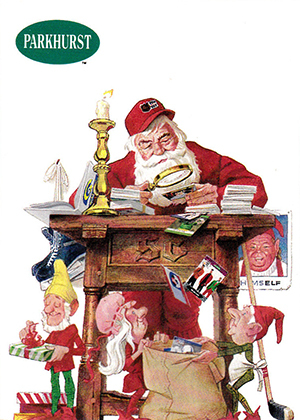 Football wasn't the only sport Pro Set made a Santa Claus short print card for. 1991-92 Parkhurst Hockey also has the a card of him done with a similar painted style. 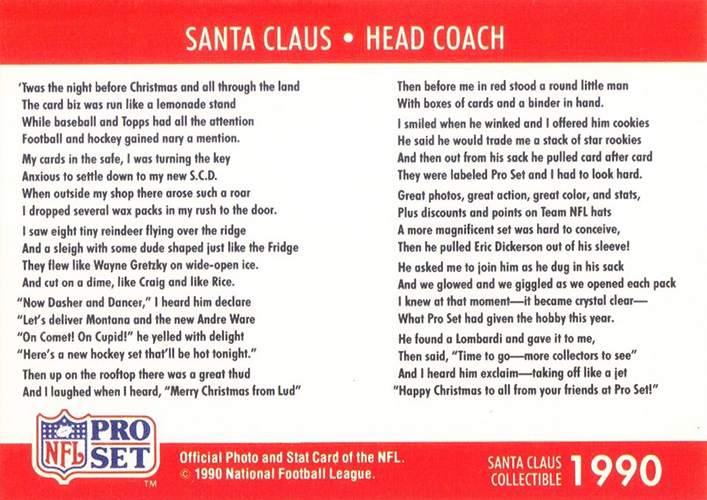 Here's a look at all of the Pro Set Santa Claus football cards. Click on the links or images to shop for cards and check current market values on eBay. 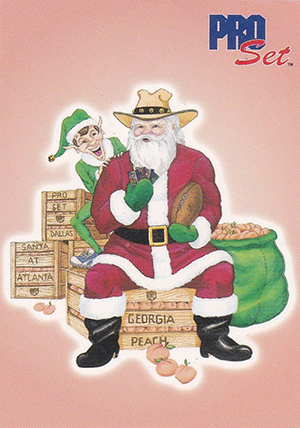 1993 Pro Set SP "Georgia Peach" Santa Claus '93 MT.